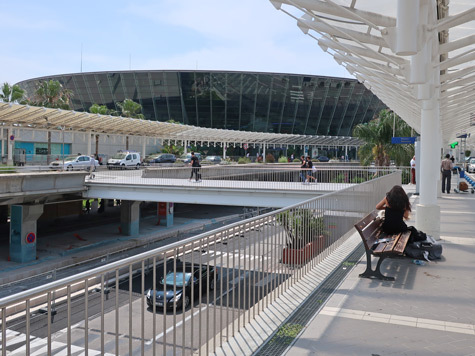 The Nice International Airport (Aeroport de Nice Cote d'Azur) is located 20 minutes west of the city centre. A free shuttle connects its two airport terminals. Bus #99 (Airport Express) runs from the international airport to downtown Nice and the city's central train station. A ticket costs around 4 euro. Bus #98 runs from the airport, along the seaside (Promenade des Anglais) to the central bus station. Bus #200 runs from Terminal 1 to Antibes and Cannes. Buses leave ever half-hour. Coach service is also available from the airport to Monaco and Cannes. For current flight information, please visit the Nice Côte d'Azur Airport website.